Give us back our car parks and tell us where you’re spending the money! Give us back our car parks and tell us where you’re spending the money. It’s Our County’s efforts to return Herefordshire Council-owned car parks in the city & market towns to their parish councils and local communities faced strong opposition at the Full Council budget meeting on Friday. Last minute changes, forced on the local opposition group’s budget amendment, downgraded the original proposal to transfer ownership of the car parks and the £4.5m income they generate each year to their respective parish councils. The group was left to argue for a funded feasibility study on the principle of such an asset transfer. This gave Conservative and Independent councillors the opportunity to counter that no money was needed to investigate the idea of asset transfers, while at the same time they also refused to support the plans. 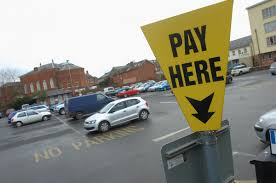 The £4.5m of car parks revenue taken annually from the local economies of the city and the market towns disappears into county council coffers and is untraceable. Government rules and the county’s own policies are each clear that car parking revenue must be spent on transport-related services or projects. But repeated questioning from It’s Our County councillors and from members of the public has failed to identify what services are supported by this money, or that these services satisfy the transport-related legal requirements. http://www.itsourcounty.org/wp-content/uploads/2017/11/Car-Park.png 183 276 PaulNeades http://www.itsourcounty.org/wp-content/uploads/2019/02/IOC-crop-Colour-1.jpg PaulNeades2017-11-23 18:14:032017-11-23 18:14:03Give us back our car parks and tell us where you’re spending the money!